This FamilySearch database includes the Estate Files (or Death Records) for 12 people born in Greece. Documents are written in English and in Dutch. The estate files are arranged in chronological order and by the first letter of the surname. Groups of documents often span many years beyond the year of death of the deceased. 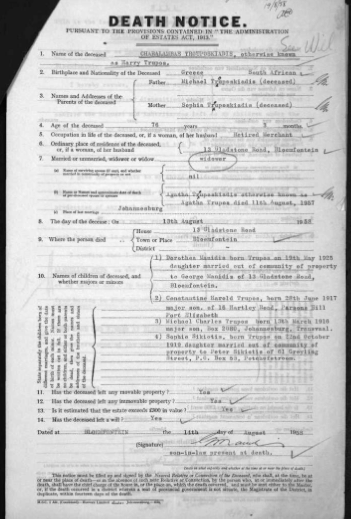 The death notice is the most important piece of genealogical information in these files; it typically contains the full name of the deceased, date and place of death, birth place, age at death, nationality, parents, occupation, residence, marital status, spouse(s), children, if the deceased left any goods and a will. Cause of death is found only on the brief death certificate.